The UTSA Triathlon team is glad to announce that our campaign for Collegiate Nationals has begun and want to thank everyone in advance for their support! Please share our story with your friends and family and wish us luck on our journey to Tempe, Arizona! 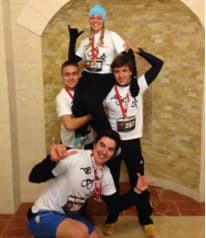 The UTSA Triathlon Team is the premier multisport family at the University of Texas at San Antonio. Over the years our organization has grown at a rapid rate and includes students’ athletes from all different types of athletic backgrounds. In addition, our team has also grown competitively, representing UTSA in multiple competitions a year with multiple athletes qualifying at the National and even World Championship level. This year will be our 6th national appearance with over 20 racers qualified to represent UTSA. Our mission as a Collegiate Triathlon Team is simple: to introduce student-athletes to the multi-sport realm of Triathlon and develop them into successful students, competitors, and future leaders. We strive to enhance each team member's college experience while supporting their individual athletic goals by providing professional coaching, top-tier competitive experiences, and a family of supportive athlete-peers. Our goal is to go to the 2019 USAT Collegiate National Championships in Tempe, Arizona with as many of our athletes as possible to represent our university, our city, and our state in the best way we know how. Thousands of hours of training have been put into preparation, and thousands more will be logged before the team crosses the finish line in Tempe. 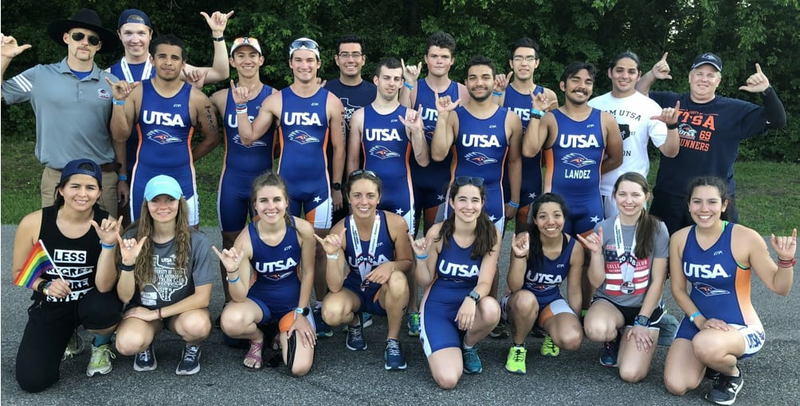 The UTSA Triathlon Team has over 20 athletes qualified for the National Championships in April! That means 20 bike transports, 20 race fees, 5 hotel rooms, 4 rental cars, and much more to get these athletes to Tempe. By donating in honor of a Team member, a portion of your Gift will go directly to that team member’s personal expenses for the trip. We ask our friends, family members, and community to consider supporting our team in this great endeavor. Your tax-deductible contributions, big or small, mean the world to us as individuals and as a team. We are extremely grateful for all of the support we've already received from our local community and hope to have another successful year of Launch UTSA. Thank you for supporting UTSA Triathlon Team! You will receive a shout out on all UTSA Triathlon social media platforms. Thank you for supporting UTSA Triathlon Team! You will receive the above perks, a postcard from the team and a custom UTSA Triathlon Team decal. Thank you for supporting UTSA Triathlon Team! You will receive the above perks and some UTSA Triathlon swag. Thank you for supporting UTSA Triathlon Team! You will receive the above perks and a UTSA Triathlon Team t-shirt. Is your company/organization interested in creating a national presence? We can help! Donate $750 to become a silver-lever sponsor. Perks: Extensive social media, website, and team promotion + Shirt Logo. Is your company/organization interested in creating a national presence? Donate $1,000 to become our gold-level business sponsor! Perks: Priority social media, website, and team promotion + Shirt Logo.